Dry Weight 111 kg / 245 lbs. Wet Weight 121 kg / 267 lbs. Reserve approx. 0.75 Litres / 0.2 gal. The new BMW G450X Sport Enduro is a unique motorcycle that completely redefines enduro riding. That’s because it’s been designed from the ground up to deliver the sort of off-road traction dreams are made of, with a brand new single-cylinder engine and a revolutionary swing-arm design. The result is a bike that is quite simply unstoppable. Thanks to a perfect riding position. Unstoppable performance is not just about the frame, engine and chassis. It’s also about the rider. The riding position – whether traveling uphill or down, sitting or standing – is also of vital importance to proper control of the bike. The G 450 X is exceptionally well balanced, with a slim body, and a long, .. at seat. And for maximum freedom of movement, the fuel tank is located beneath the seat rather than in front of it. engine – an engine like the ultra-modern DOHC single cylinder unit found in the G 450 X*. It is angled forwards, allowing for long, straight air intakes, which in turn makes possible an optimum location for the fuel injector and the two throttle valves. The engine provides punchy yet supremely controllable responses right across the rev range. In addition, the innovative positioning of the clutch directly above the crankshaft minimizes the amount of torque it has to handle, and as a result its size and weight can be signicantly reduced. Thanks to an uncompromising suspension design. To be truly unstoppable, you need outstanding grip, which means maximum ground contact at all speeds and on all surfaces. The front of the G 450 X features a fully adjustable Marzocchi upside-down fork with 300 millimetres of travel, and effortlessly takes on even the bumpiest terrain. At the rear is a fully adjustable Öhlins monoshock suspension system, also fully adjustable and with 320 millimetres of travel. Thanks to a revolutionary frame. Unstoppable performance can only be achieved with original thinking, as seen in the mounting of the rear swing-arm of the G 450 X. Its pivot point shares an axle line with the drive sprocket, so ensuring that the length of the drive chain – and as a result, the ef.. ciency of the transmission – is not affected by the compression and rebound of the suspension. The swing-arm is signi.. cantly longer than on other bikes with a comparable wheelbase, for maximum ground contact and traction on any surface. Finally, the ground-breaking frame features perfectly straight tubing, offering exceptional structural rigidity. Over the last 80 years BMW Motorrad has made off-road history time and time again. The marque is now closely involved in off-road sports as never before and is premièring an uncompromising, pedigree sport enduro in the attractive displacement class of the 450 model series: The new BMW G 450 X – a motorcycle exclusively developed for the enduro sport and the most demanding competitive races in the world. A machine that is ready to compete the moment it arrives from the factory. 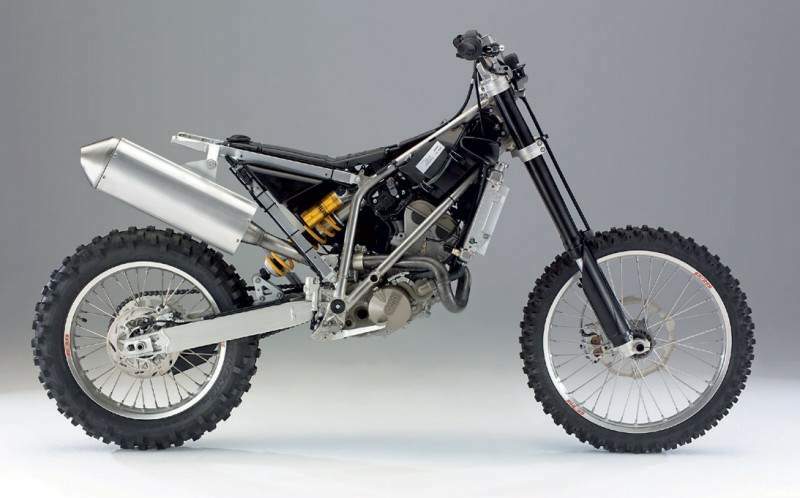 The background to the development of such a machine is the knowledge that competition-oriented enduro motorcycles represent a parameter with growth potential in the motorcycle market. Markets such as USA, Australia, and also Spain, already register – nearly traditional – stable sales in the off-road sector and BMW Motorrad wants to help shape and stimulate this and other markets for the long term. Besides, smaller volume off-road motorcycles open the gateway to both popular and professional motor sport as well as offering enough potential to also help the young generation to rediscover the fascination of motorcycles again. With the launch of the G 450 X, BMW is also pointing the way for the upcoming generation and towards sustainably securing the future of the motorcycle in general. The engine with the latest fuel injection and computer-controlled three-way catalytic converter is Euro III homologated and already meets the vehicle emissions standards which are becoming ever more rigorous today for sports events as well as for road vehicles. With these measures BMW Motorrad is also taking a further step towards public acceptance of enduro sports in future. The patented, unrivalled technical features of the new BMW G 450 X make it a driving force and contribute to the advancement of technological competition in this segment. The introduction of the tough enduro BMW G 650 X challenge has already pointed the way: with a frame and swing arm layout for improved offroad traction, low weight, compact chassis, dynamic engine. BMW Motorrad goes still further with the BMW G 450 X and is not content with constructional features traditionally seen in the class. High-tech solutions have been realised in both the engine and chassis in keeping with the cross-country sporting tradition of the house and giving the marque a fascinating exclusive off-road profile. The concept of the BMW G 450 X is based on keeping the mass concentrated as near as possible to the centre of gravity and realising a vehicle configuration that adapts perfectly to the requirements of off-road sport. The central element of this concept is the amalgamation of the bearing axle of the rear-wheel swing arm with the axis of rotation for the driving pinion so there is no change in length of the chain on compression and rebound, minimizing the effects of the final drive on the vehicle’s response. Further consequences of this unequalled technical approach are a noticeably longer swing arm for the same wheelbase as the competition and, with it, maximum traction bringing concrete advantages in enduro sport with its extreme demands on rider and machine. Fundamental to the overall plan is the saving in length through the alliance of the swinging bearing and pinion rotation axis. Not only does it enable a longer swing arm, but the modern high-performance DOHC single-cylinder engine with an output of 50 PS could also be positioned further to the rear. The cylinder was more strongly tilted to the front, thus creating space for long, straight intake tracts. In this way an ideal position was reached for the fuel injection nozzle and dual throttle valve fuel injection system. This also contributed to adapting the engine to meet the requirements of the Euro III exhaust gas norm without loss of performance, which is anything but standard in this motorcycle category. Further concept advantages include optimum protection of the airbox and voluminous air flow due to its placement above the motor in front of the seat. One consequence of the resolutely implemented, centralised concentration of masses close to the centre of gravity is the 8.5-litre tank under the seat. The filler manifold is positioned below an opening in the rear part of the seat. The reserve function is signaled by a warning lamp in the cockpit. The starter is placed in front of the engine; the battery is protected from dirt and easily accessible directly behind the control head in the upper triangular frame. The air filter is a square, flat wet element, fixed by a drawer mechanism that makes it very easy, safe, clean and extremely fast to change. For this, the right cosmetic tank cover (fixed with a quick-release fastener) is removed and the air filter drawer is pulled out. The intake funnel is positioned at the height of the control head whose high-lying position is advantageous in water splashes or wherever there is heavy dust development. The seat of the BMW G 450 X is made from a piece of special foam plastic. Foregoing a cover and not having a substructure or sump as its base brings weight advantages. Another distinctive construction feature is the relocation of the clutch directly onto the crankshaft. A position that enabled an ingenious frame construction: The frame tubes were placed straight ahead of the swing arm pivot, bringing maximum stiffness at the same time as minimum weight and lowest use of material. Further plus points of this overall arrangement resulted for the cooler. This now had enough space to be realised in one piece. This saved additional coolant hoses and and with a low weight, important for an off-road motorcycle. The development of the BMW G 450 X focuses on the ergonomic shape and design of the active driving configuration. Starting from the steering head to the rear section of the seat, the machine has an extremely slender waistline exactly where the rider sits, offering maximum freedom of movement. Especially in a standing position, the rider benefits because the absence of the tank at this point provides unrestrained clearance and the motorcycle can be kept appreciably slimmer. In this configuration the G 450 X is the first BMW enduro to be uncompromisingly developed for professional competitive racing. Like no other vehicle, the advantages of the unique construction features are revealed to the full in rugged off-road conditions; features such as the effective concentration of the masses around the centre of gravity, the engine effects eliminated by the unique swing arm mounting, the resulting low wear of chain and pinion, the extreme handling reminiscent of a 250 series motocross motorcycle with prodigious tracking stability, the low weight, the powerful engine and the high-technology spring elements that offer the ambitious enduro sports rider a number of package and design benefits in hard competition plus limitless riding pleasure. Measured by the options it incorporates, the G 450 X is the most powerful off-road BMW of all times for hard offroad riding. A dedicated team of specialist engineers and mechanics, who have also taken part in intensive off-road sport privately for many years, has developed this new model for BMW Motorrad under the motto “from passionate professionals for passionate professionals”. to the track on its own two wheels. The innovative, patented technology of the single-cylinder sports enduro concept was put to the test in all relevant highly-competitive events throughout the 2007 season by experienced and successful racing professionals such as Sascha Eckert, Simo Kirssi and Joël Smets who were able to harmonise and further develop the concept. Today the motorcycle comes ready for offroad racing and competitions at the highest level and with approval for public road traffic without further modification straight from the factory. Thanks to great traction at low revs, smooth engine output and fast revving, superior riding qualities with extremely light handling, best balance in slow “trial” sections and enormous stability at higher speeds, as well as professional or well-versed enduro riders even enduro sport novices have no problem in mastering this racing motorcycle. To corroborate the extremely sporty enduro qualities, BMW Motorrad has a works racing team that already took part in different Enduro sports events with the G 450 X during the test phase and will continue to race it in the Enduro world championship of the E2 class for example, or the German cross country championship (GCC). 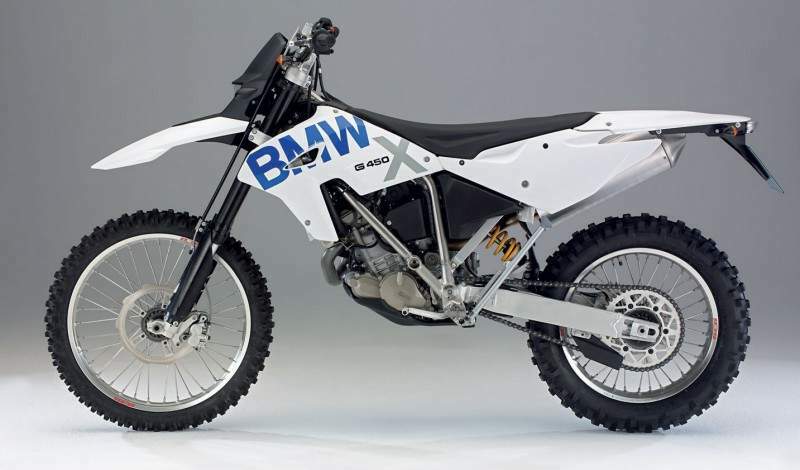 The worldwide market introduction of the BMW G 450 X is scheduled for the middle of 2008. Model Designation BMW G 450 X. The model designation G stands for a new ‘G’eneration of sporty motorcycles in the mid-range and lower cc segment, distinguished by its consistent lightweight, easy handling, tracking stability and safe riding qualities. For drive power, the focus is placed on powerful, cultivated, dependable and economic single-cylinder engines. G stands symbolically for a well thought out ‘G’eneral concept and perfection down to the last detail, for the performance of the whole vehicle, for the masterful harmony of all individual components in respect to an impressive whole. G also stands for ‘G’reat riding qualities and pure, unadulterated riding pleasure. The range of possible uses of the G models covers a wide spectrum. From the light allrounder ideal for touring to the agile super moto performer and the robust hard enduro up to the genuine sports enduro with competitive qualities. While the models of the 650 series are based on a common technical basis, but are differentiated by the consistent configuration and exclusive product features for their respective purpose, the high performance machine G 450 X is the first representative of a motorcycle generation that shows itself to be uncompromisingly competitive and success oriented, representing the sporty spearhead of the G-series as a result. Common to all G models is the high-grade substance of the product and proverbial BMW quality, independent of where it is produced. Specially tailored to customers’ riding styles and the abilities of the G 450 X, exclusive trainings are in preparation and will progressively supplement the offers for the new motorcycle. From a technical point of view, the BMW G 450 X has no forerunners. It is a brand-new development where features such as weight saving plus perfect and uncompromising configuration to the requirements of the competition-oriented offroad racing were at the forefront of the specification for the developer. Enduro racing places an enormous stress on the materials. The transition to moto cross sport is fluid, the machines tuned to the limits of performance are strained to the limits so their technology must satisfy the highest of all demands. Due to the extreme range of use, the trials of the G 450 X were extremely complex and totally new paths had to be taken in some areas. The testing included the toughest enduro performance with metre-high jumps, freezing cold up to extreme heat, water splashes and continuous racing in extremely dusty surroundings with sand and stone impacts. The vehicle must be able to withstand all these conditions reliably and sustainably. Hardly any other type of motorcycle is confronted with such requirements in this combination. The testing programme primarily included testing in a real competitive environment as well as numerous test bench tests and trials on special test tracks was correspondingly extensive and intensive. From the very outset this meant the BMW G 450 X had to prove itself in the environment where it wants to take part later in contests for the title: on the pistes of national and international enduro and cross racing where the slightest weakness of rider or machine can lead to defeat or failure. Long-term trials in terrain in both Spain and Italy rounded off the overall programme until serial production was reached. 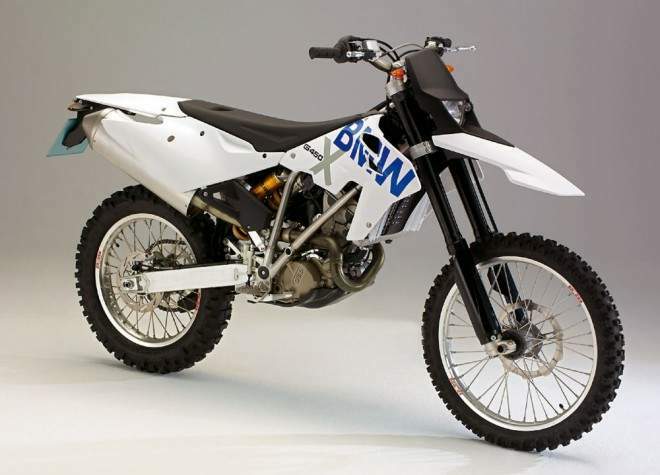 The 449 cc single-cylinder DOHC 4-stroke motor of the G 450 X was developed by BMW. The compact cylinder head of the short-stroke four valve power unit houses the technical elements of the K 1200 S: for example, the intake valves are operated by follower valves; the outlet control is implemented by tappets. A space-saving configuration distinguished by high engine speeds. Optimum performance that meets the requirements of the Euro III exhaust gas norm is realised by fuel injection with oxygen sensor regulation and a dual throttle valve system which ensure that the engine reacts more sensitively to gas commands. The crankshaft and conrod are fitted with rolling bearings and the weight-optimised two ring piston is forged. A balance shaft effectively reduces the vibrations typical of a single-cylinder engine. The constant mesh five-speed gear – standard throughout the 450 series – was widely staggered for optimum connections in racing. The primary coupling sits directly on the crankshaft and is configured as a wet clutch with a clutch diaphragm. In contrast to conventional concepts, the BMW G 450 X clutch is considerably more compact and has a smaller diameter with the same number of discs. Contrary to the conventional geared-down clutches, this is possible because the clutch only needs to transmit a correspondingly reduced torque on the transmission input shaft. The clutch is operated by a cable. The engine is fed with oil by a wet sump lubrication system. Two oil pumps, a pressure pump and a suction pump use the same volumes of oil to lubricate the gearbox and the crankshaft. The two integrated oil sieves and oil filter are easy to access from the left side of the engine for replacement. The volume of oil of approximately one litre can be checked via an inspection glass. An intermediate shaft with integrated ventilation function transfers the power from the crankshaft to the gearbox and means that the crankshaft of the G 450 X engine turns backWards. The cylinder is tilted forward by approximately 30 degrees, enabling the centre of gravity to be moved in the direction of the front wheel thereby benefitting the suspension. A further advantage of tilting the cylinder is the creation of space for the intake air ducting that can now come vertically from above and virtually straight, promoting optimum performance. The engine of the BMW G 450 X, condensed into 12 : 1, is started up by an electric starter; an additional kickstarter is unnecessary thanks to a powerful battery and fuel injection with invariably reliable starting action. An automatic decompression function with a centrifugal force valve lifter reduces the power demanded by the starter. Even when the machine has to travel for longer periods at higher revs in difficult and slow off-road sections, the engine is never excessively thermally loaded thanks to its large-volume, single-piece water cooler. A fan designed for the series behind the cooler provides sufficient air flow rate at low flow speeds. The series exhaust system is made of stainless steel and the catalytic converter is fitted in the silencer (absorption silencer). For exclusive use in competitive racing, optional purely sporting end silencers are offered as special equipment and it is possible to switch to the extreme “race” mapping stored in the engine control unit. Despite the powerful alternator and electric starter, the high-performance engine of the BMW G 450 X weighs no more than the aggregate of competitor motorcycles (less than 30 kilogrammes). The exact power and torque data are not yet fixed. The chassis of the BMW G 450 X is a completely new development that uses selected high-quality components and materials. 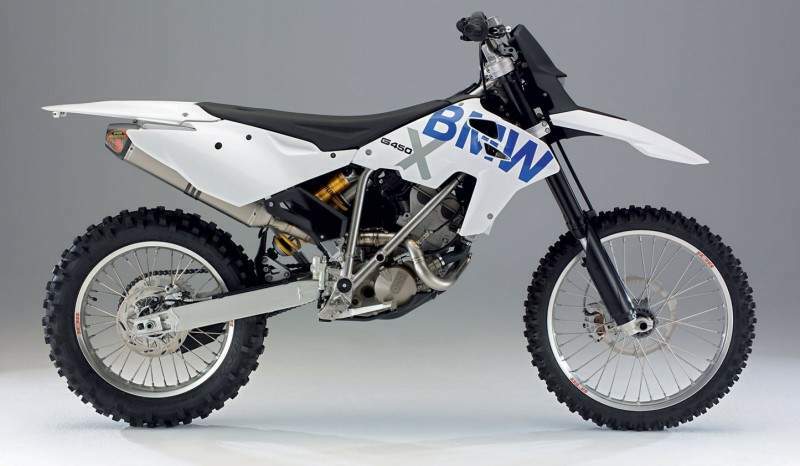 The years of enduro experience of BMW Motorrad flowed into the development of the chassis. The main consideration in the geometry and overall configuration of the chassis was to meet the especially high demands of off-road racing. The results are excellent properties in terrain with ease of handling, great maneuverability and extreme tracking stability. The frame layout is based on the experiences of the development engineers, the know-how from competitive racing and attendant research and development work. The knowledge gained from earlier rally sport activities was also incorporated. The frame of the BMW G 450 X is an absolutely new development that differs in principle from all constructions of the competition. In the main part it consists of thin walled, but high-strength stainless steel precision tubes and is welded to the node points with forged parts deployed for the purpose. No additional surface treatment is necessary. The entire main frame weighs merely 8.6 kilograms and is distinguished by excellent stiffness. The lower bow of the frame tubes runs directly from the swinging axle straight to the steering head. On the other hand, the upper bow creates a direct connection between the suspension strut mount and steering head. The wheel forces are braced centrally on the frame over the suspension strut so that the light rear frame is bolted to the main frame and is formed by aluminium square profiles now only needs to bear the weight of the rider. All in all this construction enables the optimum flow of force, requires minimum use of material, thus allowing a hitherto unrivalled ratio of rigidity to weight. The 18-inch rear wheel is suspended in a robustly dimensioned two-arm swing arm made from aluminium square profiles which supports a directly linked Öhlins central suspension strut with a generous spring travel of 320 mm. This high-technology element is variably adjustable in pressure and outward stroke damping as well as in the spring pre-tension. The suspension of the 21-inch front wheel is undertaken by a 45 mm upside-down fork by Marzocchi that absorbs even the roughest bumps with a spring travel of 300 mm and is also fully adjustable. A powerful brake system with double-piston floating caliper from Brembo ensures the deceleration of the BMW G 450 X. The front single brake disc has a diameter of 260 mm, the rear disc measures 220 mm. An ABS is not usual in this class and, considering where it is used, the brake assist on the G 450 X would also be counterproductive. In order to live up to the the harshest off-road conditions, the BMW G 450 X has a light, impact resistant and highly stable plastic under ride protection fitted as standard and that has already proved itself in racing. The motorcycle also has a double-butted Magura aluminium handlebar that guarantees optimum control on all pistes. 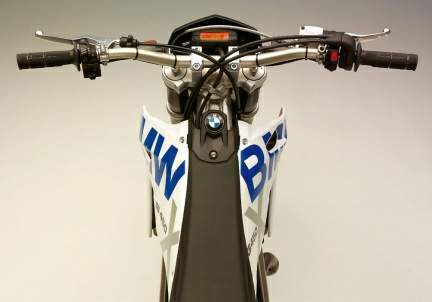 The real finesse in the chassis sector and a unique feature of the BMW G 450 X is the coaxial mount of the swing arm and chain pinion. The swing arm pivot has been mounted through the hollow gearbox output so that there is no longer any change in length of the chain on compression and rebound over the entire spring travel. The chain tension remains constant independent of the compression position; the pinion, chain and chain ring are subject to less wear than in conventional constructions. A positive effect on the riding characteristics is that the effect of changing loads on the powertrain is now noticeably reduced. Thanks to the patented coaxial mounting of the swing arm and drive chain pinion plus a wheelbase at competition level, the swing arm is 30 mm longer, markedly improving the traction properties. The rear wheel remains longer in contact with the ground in all situations, keeping the driving force better on the piste. Also, compared with the competition, a significantly greater length adjustment range of the rear wheel results which means different pinion chain chain ring combinations can be used with the same chain with no problem. When a pinion has to be replaced, the swing arm must be removed; however, in comparison to conventional concepts, this is not a particularly time consuming task. An experienced mechanic can replace the pinion in about 15 minutes and, because of the much lower wear of the entire final drive, the pinion needs to be replaced less often then by the competition. The looks of the BMW G 450 X immediately make clear the affinity to BMW Motorrad. The dynamic “Flyline” allows the new motorcycle to be identified as a typical member of the BMW enduro world, the most striking element is the typical family beak – also the distinguishing characteristic shared by all GS models. The optical appearance also expresses pure sporting performance with the associated aggression. This results in the look and feel of a fascinating vehicle that appears with the right to ride to win in competitive races. The colour concept of the G 450 X is oriented to the G 650 Xchallenge. The standard colour is “racing white” with blue accents typical of BMW which highlights the affiliation to the G model family and the new, sporty enduro line from BMW. The exact technical data of the BMW G 450 X have not yet been finally fixed. The maximum output is around 37 kW (50 PS) with a best torque value of approximately 48 Nm. The overall weight with full tank is about 120 kg which means the BMW G 450 X is lighter than the current best weight values in this class. This value is all the more impressive because this is a vehicle with fuel injection, catalytic converter, electric starter and Euro III homologation that points the way to the future of the enduro sport. The exact geometrical data of the chassis is subject to the last fine tuning activities and will be made known at a later date.